privilege as part of the AREG – Ray, ‘5RR, Mark ‘5QI and myself, Bob ‘5FO plan on activating the special event station VI5ANZAC for a few hours. There will be a couple more AREG members whom will also be part of this activity. Please keep an eye on both the AREG website and here for any updates. We will be operating QRP Portable from the Morialta CP, VKFF-783 using my “normal” portable station/s. This will be a QRP SSB activation and Yes, I know that this does have limitations and we may or may not be able to work everyone. raining, we plan on being on the air. We will confirm on the day. time) and plan to operate to 21:30 local time. This is approx 08:15UTC to 12:00UTC. We will have a 40M station on-air for the duration and potentially look at working on other bands during the evening as well to try and put this station within reach of all of VK (and beyond). success of the QRP contest a few weeks ago, we are considering moving the 20M station to 80M on 3.675 at around the 10:30-1100UTC time. can try and co-ordinate, we might be able to try for a short time on other bands. I am extending this invitation to all of the “regulars” whom I chase and who chase me whilst I am out portable, and hope that We can log some of the Regular portable operators and non-regular chasers as well. Our target for the evening will be to work at least 100 stations across all VK call areas, and hope to be early enough to work ZL stations as well. We will NOT be spotting on Parks and Peaks, but we will be operating in accordance such that all contacts are valid for both VKFF and SANPCPA. members and any other interested parties and we hope to work you on the evening of the 28th. Once we are On-Air and we we will be asking early on for stations to spot us on the Clusters – we may not be able to self-spot. 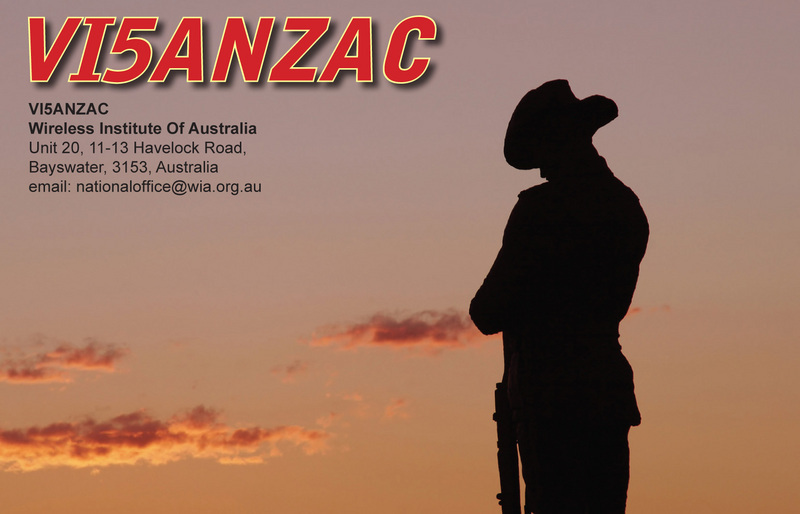 There will be a lot of other opportunities to work VI5ANZAC so if you are not able to get in our logs on the 28th, keep an ear out across the whole week around the bands. The AREG will be operating over the weekend and during this week in various capacities. At the conclusion, we will be providing the full logs to the WIA who are co-ordinating the eQSL’s – Please see the WIA website for the details and roster.